Today we are changing it up a little bit and interviewing Malori Maeva of Hoot & Holler, a self-described renegade florist here in Arizona. Most people love flowers and think professional flower arrangements are gorgeous and a great addition to any space. From what I see looking at floral arrangements, there are the standard arrangements and then there is the work Malori is doing at Hoot & Holler. It is simply amazing. Her website is full of eye-catching, unique, and colorful displays of great floral work. Be sure to hop on over to her site and take a look for yourself. You will not be sorry you did, you may even be wishing for one of her floral crowns like we are! 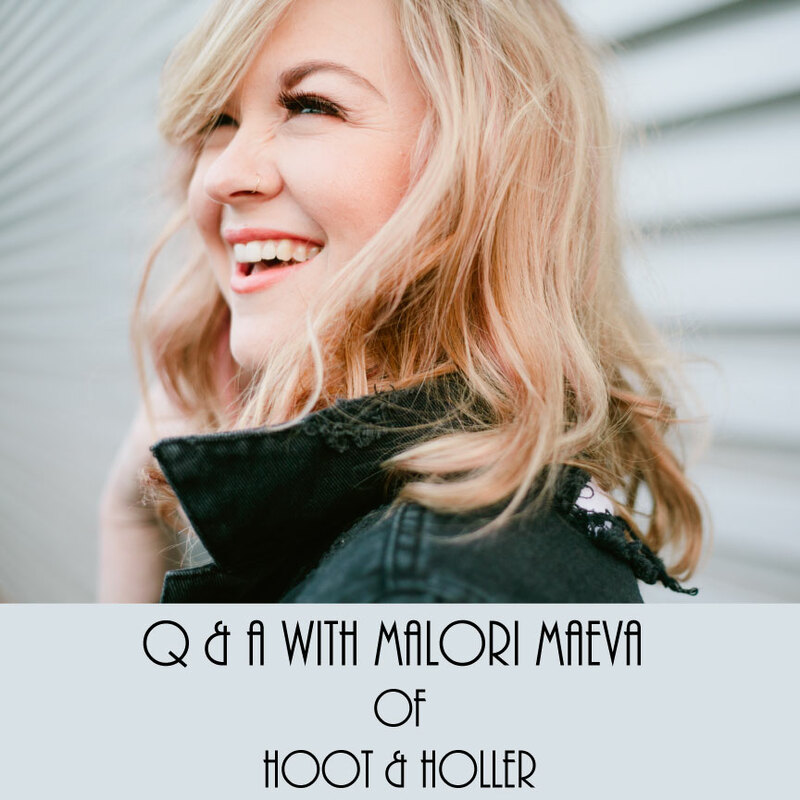 Read on to learn more about Malori and Hoot & Holler. F.I.N.D.S. : First of all you have a gorgeous website. How did you get started with floral design? Did you always know you would eventually start your own company or was that a surprise to you when it happened? Malori: Thank you so much! We’re actually in the process of relaunching our website so stay tuned for a bigger and better version late this summer! I started in floral design totally by accident. I was working a 9-5 as a project assistant for a restaurant group and discovered that they handled all of their floral arrangements in house. I asked to shadow the designer and after one day was totally hooked. After a few months of handling the flowers for the restaurants, I realized that I might really be able to make my side hustle a full time job. I’ve always wanted to own my own company so finding my love for floral design allowed me the opportunity to get started down this entrepreneurial path in life. F.I.N.D.S. : I love that you describe yourself as a renegade florist. Just looking at the images of your work, it is very unique, from the arrangements to the flowers used. It is not something I see all the time. How do you come up with the ideas for your arrangements? Malori: I am almost completely self-taught so I think that the unique look of my work stems largely from the fact that I was never taught the proper way to be a floral designer. Not knowing the “rules” has allowed me to break them with ease and has given me an edge in the crowded floral marketplace. I work mainly off of color and the overall feel of an arrangement. I completely zone out while I’m working and that’s when I create my favorite pieces. Malori: Yes! 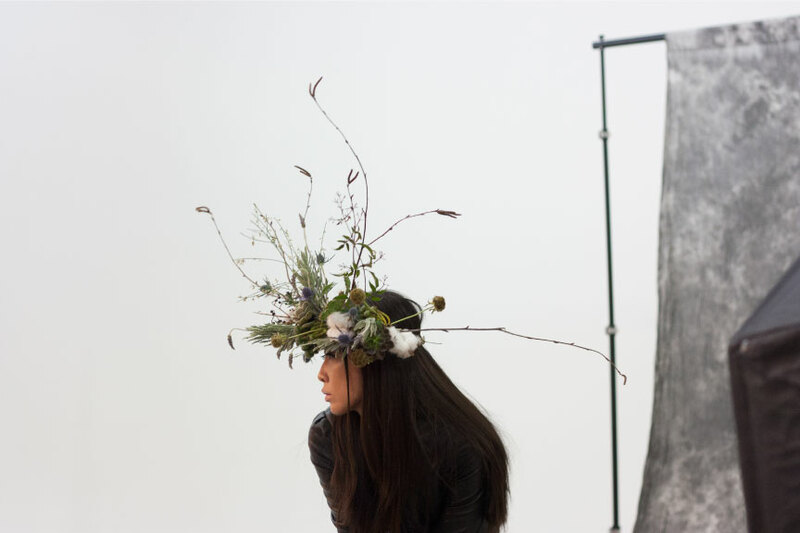 Other floral designers that really inspire me are Kiana Underwood (@tulipinadesign), Krissy Price (@bostonpollen), and Nicole Land (@soilandstem). Other inspiring designers or artists for me are Bri Emery (@designlovefest), Paul Octavious (@pauloctavious), Jen Gotch (@jengotch) just to name a few. It’s funny because I’m really inspired by super bright colors and kind of quirky imagery but my work definitely trends to the darker side of life. F.I.N.D.S. : The first thing I think a lot of people think of needing a florist for is for a wedding. 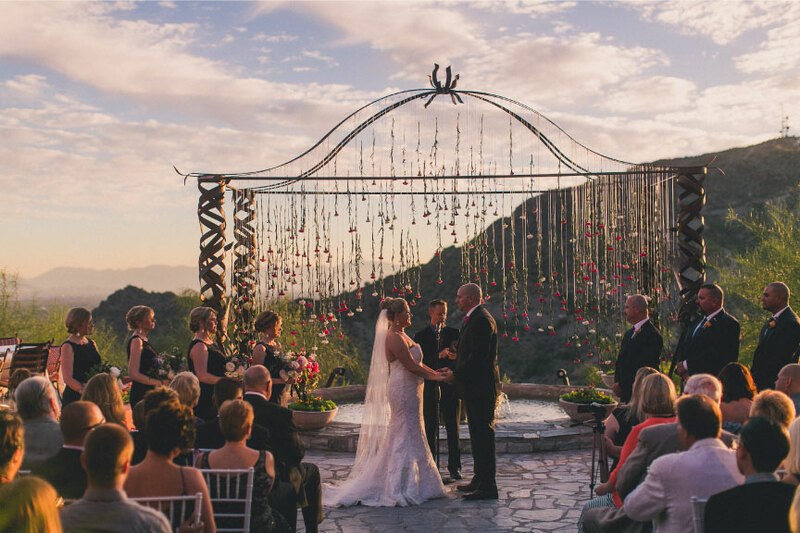 Can you tell us a little about the services you offer for weddings? How does what you do stand out versus other florists? Malori: Of course! We offer any service you’d want for your wedding from the standard pieces such as bouquets, boutonnieres, corsages, centerpieces, etc. However, we also offer a lot of custom options that you would never get from some of the bigger florists out there. We create custom arches for our couples (see attached photo for one example. My team and I individually hung over 700 carnations on this 12ft x 18ft arch for a wedding last October), wearable floral pieces, and really any idea that our couples have that they like to see brought to life (ex: boutonnieres built in bullet shell casings). Another unique facet to our business is that everything is 100% custom. We’ll never sit down with a book and have you point at work we’ve already done to be recreated exactly for you. You’ll never find a floral recipe card in our studio or see us on FTD or 1-800-flowers. Our clients love that everything is created only for them and honestly, I love it too! It keeps every project fresh and challenging and ensures that Hoot & Holler is always growing and evolving. F.I.N.D.S. : Now that we talked about weddings, I am a firm believer that people need flowers for more than just a wedding. As an interior designer I love to see fresh flowers and greenery in interior spaces. Do you also agree that everyone needs fresh arrangements in their space? Malori: PREACH! Fresh flowers make such a huge difference in a space and I am a firm believer that a vase of live blooms can completely change the vibe of a space. F.I.N.D.S. : I know not everyone has the budget for fresh flowers on a weekly basis, do you do any work with faux arrangements or is it strictly fresh flowers and greenery? Malori: We don’t typically work with faux arrangements. For the right client we would absolutely tackle it but there’s something to be said for fresh flowers. If you’re working with a budget, keep in mind that there are incredibly cost effective ways to keep fresh flowers in your space. Trader Joe’s has bunches for as low as $3.99 and their flowers have excellent staying power. If you enjoy having fresh flowers at all times and are working within a budget, I recommend creating arrangements yourself using these cost effective blooms then splurging for a florist-created piece on special occasions or weeks when you’re feeling down. F.I.N.D.S. 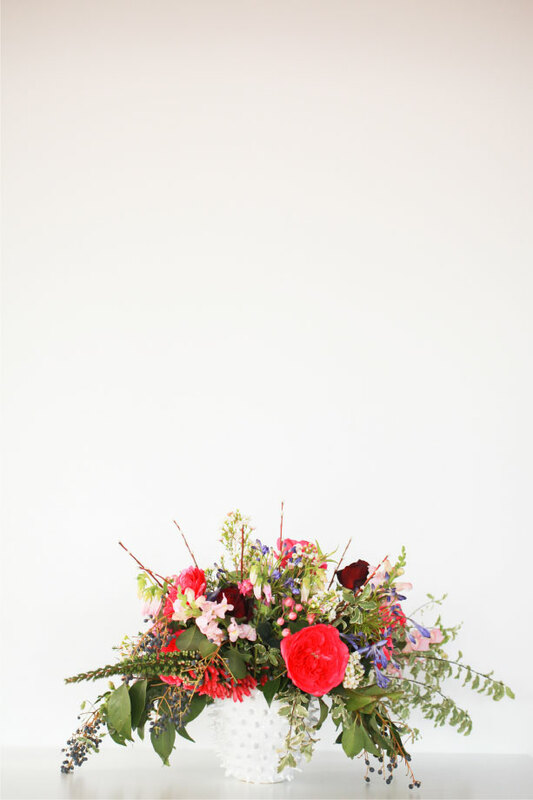 : Do you have any tips on how to use flowers to spruce up a space for an event or party? Or some tips for the DIYer out there that has interest in making their own arrangements? Malori: If you’re DIYing your flowers for an event or party, there are a few ways to help make them look more professional. First, consider your vase. You want flowers that are going to be 1.5x the height of your vase so if you bought a short vase you probably wouldn’t want to fill it with gladiolus. Second, use greenery, even if you have to clip a few branches from that tree in your front yard. Adding greens to your arrangement instantly makes it look more expensive and professional. My last tip would be if you are afraid of tackling a fancy arrangement, stick to bud vases. There are so many choices for really cool bud vases and having great vases is sometimes half the battle! F.I.N.D.S. : Speaking of those who DIY, I noticed on your site that you offer workshops. How does that work and what is needed to get a workshop scheduled? Malori: Typically we work with local boutiques and restaurants for our workshops. They graciously host us in their space and we teach on whatever topic appeals most to their customers. They’re always such a fun evening and we love teaching people our style of design. We also offer private workshops. We’ll come to your home or to your private event and teach your choice of project. If you want a private workshop we ask that you bring together a minimum of 5 friends for the party! Malori: As I mentioned above, my starting point is typically color. Whether I’m working with a client or I’m just creating for fun, I start by deciding on a color story. From there, I pull blooms that work well together in a mix of shapes, textures, and sizes. I typically try to use a minimum of 3 focal flowers, 3-5 “filler flowers” and 2 types of greens in arrangements. I love that wild look and for me it’s kind of a “more the merrier” feeling in terms of my ingredients. Once I’ve sourced everything, I pull a vase that fits with the feeling of the piece then I throw on some hip hop music and rap while I work. I love being able to get lost in my process when I’m actually building everything. There’s a point where you have to let go of a process and just get lost in creation. Malori: I have a little bag of tricks that I really couldn’t live without. I swap between these gorgeous gold scissors from Anthropologie and my spring loaded shears. I also love using grapevine wire and couldn’t live without my various gauges of floral wire and tape. Aside from my actual tools of the trade, I really love using Pinterest and Instagram to see what’s happening in the floral world. As far as print materials, I love The Flower Recipe Book and The Wreath Recipe Book and I live for my monthly dose of Bon Appetite. That magazine is so beautifully photographed and food is a huge source of inspiration to me in my work. Monday & Tuesday – Emails and paperwork all day long. I work on quotes for upcoming projects, order product, schedule my blog posts, edit photos, pay my sales taxes, get up to date on my bookkeeping, etc. etc. I typically camp out in a coffee shop or my office these days and work for 9-10 hours straight to stay on top of everything. Wednesday – I try my best to schedule my meetings and consults on Wednesdays. I run around town picking up supplies that I source locally, meet with other creatives for coffee, and tackle creative collaborations like photoshoots. Thursday – If I have an event on the weekend, I typically spend the end of my week prepping for it. If it’s an off weekend, I get to squeeze in another paperwork/email day which is GLORIOUS. I also like to take my Thursday to work on new products and programs. Hoot & Holler will be offering a whole new slew of fun things late this summer so I’m currently chipping away at the planning that is involved in those launches. Friday – Event Prep! It’s a RARE week when I’m not prepping for a wedding/party/event/photoshoot/custom order on my Friday. This is a day for floral play and I love it. Saturday & Sunday – I typically work all weekend as well. Most weddings land on a weekend date so I spend my time setting up/breaking down events and trying to take a little bit of down time where I can grab it. I’m huge on brunch so I like to try new breakfast places on the weekend when I’m able! Malori: I LOVE to travel. Love it. I used to live in Chicago so it’s usually my first choice because it feels like a second home to me and it’s full of the most incredible inspiration. A trip to Chicago always leaves me feeling refreshed. I also love to spend time in the Pacific Northwest (Seattle, Tacoma, Portland), on the beach in California, or exploring San Francisco and the wine country. I spend the vast majority of my summer traveling and try to visit a few new cities every year. In July of this year I’ll be spending a week in New York and I’m so excited! Malori: If you’re starting a business, it has to be something that you really love. Starting a business because you want to be rich or because you don’t want to work much is a sure way to fail. Any entrepreneur can tell you this, but I’ve never worked more or been on a tighter budget then I am now that I work for myself. If I didn’t have a huge love for what I did every day, I never would have made it. You have to have a serious amount of intrinsic motivation to block out all the haters, the 15 hour days, and the days where nothing goes well. Having said that, it’s TOTALLY worth it. If you are like us then you have totally fallen in love with Malori and all she does by now and I’m sure you would love to know where you can find and follow all she is up to online. You can find her on the Hoot & Holler website, Instagram (@hootandholler), Twitter (@hootandhollerco), and on Facebook. And if you are itching to work with her this very second then give her a call at 480-282-3366.